Why stick with store-bought home prints? Your space deserves a decorative touch that’s totally you! Try embroidering your own art statement (we promise it’s not scary). In our beginner-friendly class we’ll give you a rundown on the basics of this classic craft. how to create essential embroidery stitches, such as the running stitch, backstitch, split stitch and more. No tools? No problem! We’ve got everything you need, including a colorful selection of threads and supplies as well as design suggestions. We encourage you to brainstorm and print out any ideas you have for your embroidery project. We suggest simple line drawings, something that isn’t too complicated to complete in the two hour workshop. The embroidery hoops are 6”, so keep your design to around 4”-5”. 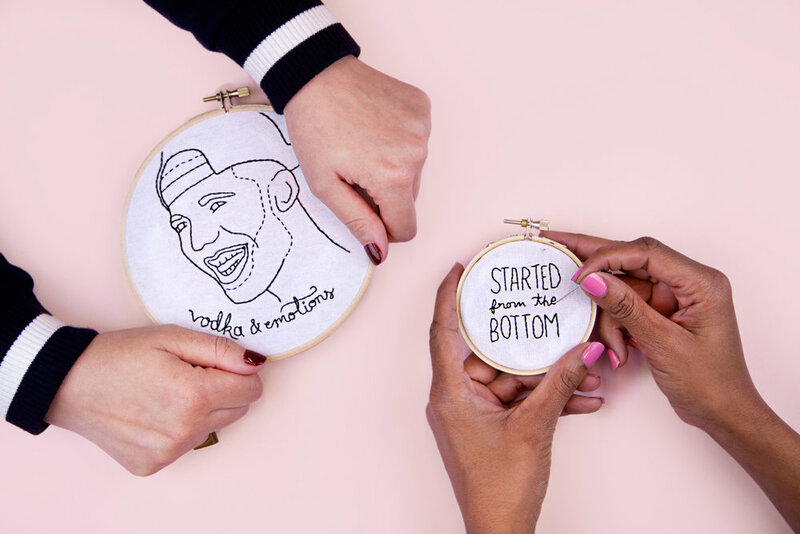 We have a selection of beginner friendly embroidery patterns, so don't fret if you don't have time to print your own! You are of course free to draw your own original designs.